Many people, accustomed to hearing the term "meditation" used in conjunction with Eastern religions, would be surprised to know that there are also Jewish forms of meditation. One which comes to mind is "hitboddut" or the Hassidic practice of isolating oneself when contemplating one's relationship with God and one's fellow man. 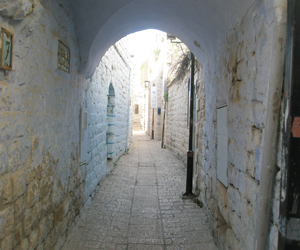 Breslev Hassidim are known for their efforts to find lonely spots in nature, as their Rebbe, Rabbi Nachman, did one hundred and fifty years ago. Today however, most people who feel the need to sit and meditate study the practice through Hinduism, Buddhism and other Eastern traditions. Slowly, however, more people are becoming aware of the Jewish meditative practices, specifically those which are found in the study of Kabbalah. Chaya Leader is one such teacher of Jewish Kabbalistic meditation. Chaya has been studying Kabbalah with family members who are rabbis and teachers of Kabbalah in Israel and abroad. She moved to Israel in 1970 and has been teaching Jewish spirituality workshops since the 80's. The Kol Kabbalah workshop was born when she was on staff at the health spa in Israel-Mitspe Allumot-2007-2008. Chaya explains, "Although I enjoy textual study of the vast literature of Kabbalah, it is not enough for me to simply study the texts and consider the concepts, as profound as they are; it has always been important to me to tie these concepts with flesh and blood reality." Tying the study of Kabbalah to a reality that one can feel and be a part of, rather than simply learning and understanding texts, is where Chaya brings her style of Kabbalistic meditation in to play. She works with individuals and groups to integrate the ideas of Kabbalah with healing and reparation. Chaya's meditation techniques center on sounding the Hebrew letters-emphasizing the vowel sounds-- through chanting and integrating these sounds with visualizations. "We start with silent meditation, an ancient Jewish practice that allows us to release the stress of repetitive, negative nagging thoughts and to be open to being receptive to higher thoughts and emotions. The word kabbalah means 'receptivity.' For some people it's strange at first to be chanting sounds, but they soon feel comfortable and then start to enjoy the experience" Chaya says. "Many people have a transformative experience--even in the short space of the workshop-- and that is what these workshops are about--getting a taste, a tone, a whiff of our own soul". Chaya works with people of all backgrounds, religious and secular. She finds that non-religious people feel at ease with her non-threatening methodology, while religious people often feel their religious practices renewed and refreshed. One young participant from a workshop wrote, following a session, " Chaya Leader's Kol Kabbalah workshop is an innovative, expressive, inward looking, soul calming and joyous experience. The workshop, using diverse elements derived from ancient Kabbalistic meditation techniques, awakens new parts of your Jewish soul and recharges your energies, increasing self-awareness and promoting a feeling of flowing well-being and invigoration. Chaya's dynamic, yet non-invasive guiding allows you to feel completely comfortable in partaking of the connection between sound and mind in a new way--opening consciousness to Jewish identity and soul. After an hour of Chaya's workshop I felt so warm and calm inside and had a huge smile on my face. "